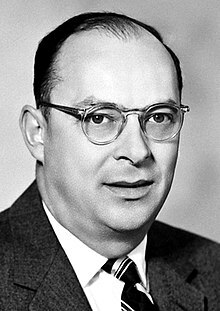 John Bardeen (/bɑːrˈdiːn/; Mey 23, 1908 – Januar 30, 1991) wis an American pheesicist an electrical ingineer, the anly person tae hae wan the Nobel Prize in Pheesics twace: first in 1956 wi William Shockley an Walter Brattain for the invention o the transistor; an again in 1972 wi Leon N Cooper an John Robert Schrieffer for a fundamental theory o conventional superconductivity kent as the BCS theory. ↑ "Elizabeth Greytak, Systems Analyst". Boston: The Boston Globe. 2000-12-25. Retrieved 2014-12-27. ↑ 3.0 3.1 Pippard, B. (1994). "John Bardeen. 23 May 1908–30 January 1991". Biographical Memoirs of Fellows of the Royal Society. 39: 20–11. doi:10.1098/rsbm.1994.0002. ↑ "Nice Guys Can Finish As Geniuses at University of Illinois in Urbana-Champaign". Chicago Tribune: Knight Ridder News Service. 2003-01-25. Retrieved 2007-08-03. This page wis last eeditit on 17 Mairch 2017, at 15:19.